My first impression of the “Main House” or “Randolph Cabin” was how old and very run-down it is. However, as we delved deeper into exploring and mapping it, the more evidence you could see of the life it used to have. The patchwork and ingenuity used to build and repair the house over the years is amazing. The Moon family started building the cabin and the Randolph family completed it with whatever materials they could find around the homestead. “The cabin remains a testament to folks who wasted nothing. Not a piece of twine or a single scrap of newspaper…” (Devlin 2014:1). The house does not look like much today, but you can see the care and thought put into the house. From the walkway lined with Dane’s Blood flowers to the front door with decorative door knob, the lilac trees, and bay window, there are small hints that give us the sense of home from when the Randolph family lived here. In April 1907, William and Emma Randolph and their two boys bought the homestead from George and Helen Moon. Before the Randolph’s took over the property, George and Helen had already started construction on the Main House and completed the living room and attic. The Randolphs added the kitchen, pantry, and bedroom (DeSilvey 2002:58-59). They also planted their own kitchen garden to the north of the house (Hagen 2010). In 1911, the Randolph’s youngest son William was born just as the farm really began to thrive (DeSilvey 2002:20-21). 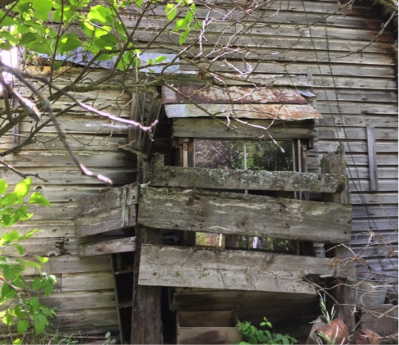 Even through the Great Depression the family and the farm were able to survive by making do with what they already had, placing further emphasis on the cycle of reuse that was already deeply engrained into life at the homestead. The cabin itself reflects this cycle with its mixture of salvaged lumber and boxcar wood used as siding for the house. There are obvious areas in which damage to the house was patched with whatever was on hand, such as extra tin and salvaged lumber. When the East side of the house (bedroom) was added they overlapped the siding onto the existing north elevation. “This overlapping was done crudely, apparently in an attempt to visually integrate the addition with the original building” (Hagen 2010). When exploring inside the house you can get a sense of what life may have been like for the Randolphs. If you look past the state of decay the house is now in, you can imagine the boys taking off their boots in the mudroom so they could come in and wash up for dinner, while Emma stood cooking at the stove. The attached “cold-storage” pantry would have been full of canned goods and other foods. Some of those still remain. The family might have gathered in the living room to read before bed, perhaps from the quite varied collection of books including National Geographic, or Popular Mechanics periodicals, which we discovered while working in the cabin this summer. The family moved up to what is now the caretakers house in 1946 after a fire nearly burned down the main cabin in 1945 (Hagen 2010). William and Emma lived in the newly renovated house until 1956 when Emma passed away. William followed just a few months later (DeSilvey 2002:35-36). It is likely that their youngest son Bill continued to live in the main house until his parents' deaths, when he moved up to the renovated house. Bill passed away in 1995. After his death there were multiple estate sales and it is unknown what objects from the main house were sold. There has been relatively little activity from humans in the house since then and other critters have taken up residence - bull snakes, mice, wasps, spiders, and even a badger who burrowed through the kitchen wall on the west side to make the stove his new home. As we enter the heat of summer, the importance of having cool water available to drink cannot be overstated. While we drive our air-conditioned cars carrying coolers of ice and water on long summer trips, it is easy to take for granted our modern refrigeration technology. Back in the days of hood ornaments and before insulated coolers were common, folks had a surprising way of keeping their water cool during long, hot, summer drives. Canvas water bags, such as the one in the picture below, were used to hold water and keep it cool and refreshing. This particular bag was found hanging above the sink in the homestead’s Main Cabin kitchen. You may be wondering how canvas, a fabric, could be used to hold water. Not only did the canvas hold water, but it also enabled the water inside to remain cool. How did this work? Canvas water bags cooled water through evaporation. As stated on the front of the bag, one must saturate the canvas before filling it with water. Doing this allows the water molecules to permeate the cloth fibers and utilize water surface tension to keep the water inside the bag from leaking. A little bit of leaching was actually what cooled the water inside the bag. When the water on the outside surface evaporated it pulled just a little bit through the canvas, and the evaporation process had a cooling effect on the water inside. So what do cars have to do with water bags? The water bags were hung from a car’s hood ornament and positioned in front of the grille in order to use the wind passing by the car to further cool the water. In most cases, this meant that the water in the bag, although not ice cold, was generally 25-30 degrees colder than the temperature outside. This would have been greatly refreshing during long, hot car trips. No need for ice and a cooler, when you had a canvas bag and a car grille to hang it on! Archaeology is the study of past human behavior through the lens of material goods. What we leave behind can be used in the study of who we were. The Moon-Randolph Homestead in Missoula, Montana is a site that is pretty well documented historically and the dearth of material goods at the site act as varied time-capsules of human occupation. When we study this past and the treasures left behind, we can’t help but add in our own interpretation of the narrative. Our biases, world-view, and experience are all bundled into how we see the world we are attempting to study, and the Moon-Randolph Homestead is a working example of how individuals can interpret a site. In the book, Butterflies and Railroad Ties: A History of a Montana Homestead, Caitlin DeSilvey writes what feels like an invitation, “Every person who visits and stays long enough to listen and look – naturalists, researchers, artists, neighbors, children – becomes part of our unfolding awareness of this storied landscape” (2002:5). At the outset of this field school I brought my own biases and experiences to the study. As we began our orientation day, we walked around the site with the caretaker, Caroline Stephens, and got familiar with the buildings, material goods, and the landscape where we would be taking on the task of measuring the Main Cabin with the goal of building a preservation strategy for the structure. But on this first day as we walked the grounds, just outside the Moon cabin, I noticed a curious artifact - a bicycle that had been secured to a metal frame. Was it some type of re-purposed machinery, I wondered? My biases and world-view in this case is greatly influenced by my love for bicycles and cycling. This influenced my interpretation of the site whereas others may have noticed different objects and been drawn toward the study of those. This bicycle apparatus consists of a Phillips brand butted steel frame and the unique design can aid in setting it into a temporal place. The type of frame and the way in which the pedal arms are secured to the bicycle tell us that the bike was built before the 1970’s. This is helpful in establishing a timeline for when this object entered the timeline of the Moon-Randolph Homestead. 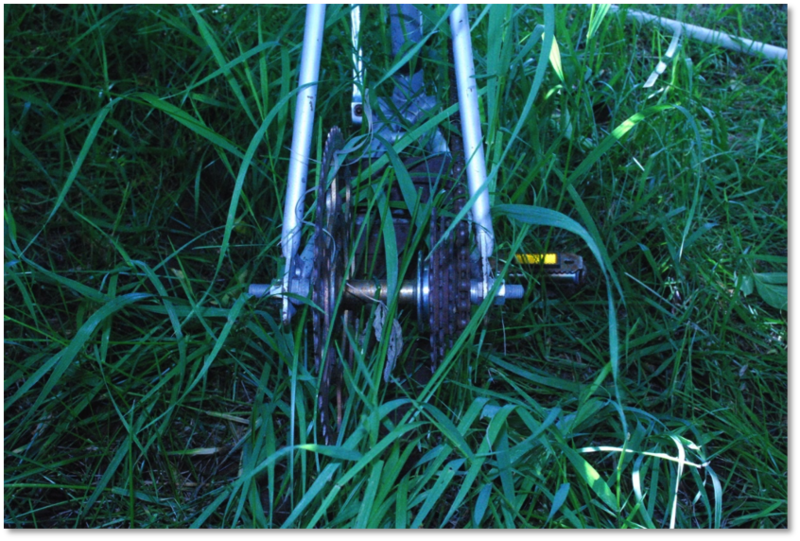 This bike (now an artifact) was located near a well and had been pushed into the trees, seemingly to make way for public foot-traffic. Here we find the bicycle “in situ” or “in its original place.” On the right of the photo, part of the stand or frame is noticeable. There is a modification to the original frame which would have kept the bicycle, and perhaps the operator, upright while they used the “machine” for whatever purpose. Where the modified bicycle is found may not be where it was used. It is, however, in the vicinity of a water well. This photo shows the cotter pin attachment for the crank arms. This type of bike manufacturing has long been discontinued with the exception of very few modern bicycles. From the bottom right hand corner and across the photo we can make out the clever handmade frame-stand. This photograph highlights the double-cog where a wheel would have been. This modification is unique to this artifact as most bicycle wheel hubs do not feature this type of set-up. What purpose did this serve? The location of this object, its modification, and the potential age of the building materials, all help to take a snap-shot in time of the goings-on at the Homestead. Interpretation is an essential component of this type of study as it helps to flesh out or tell a more holistic story. If archaeologists were to simply rely on measurements, geometry, scatter patterns, and various other metrics, the human elements of our study of the past would surely suffer. As Caitlin DeSilvey aptly noted; “Every visitor to the homestead sees the place through their own curious lens, picking up on the details that others had overlooked” (2002:49). I think that is beautiful. DeSilvey, Caitlin. 2002. 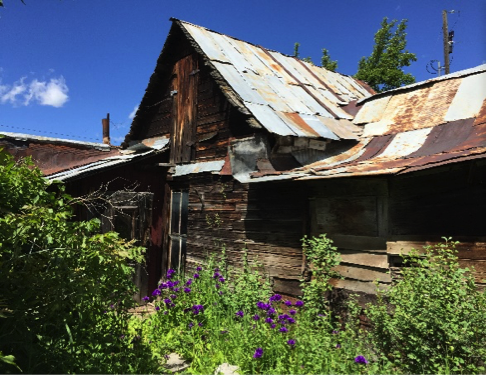 Butterflies and Railroad Ties: A History of a Montana Homestead. North Missoula Community Development Corporation, Missoula, MT. Back in February of this year when I visited with Caroline Stephens, one of the homestead’s caretakers, I will admit that I didn’t know what we were getting ourselves into as we eagerly planned an archaeological field school for this summer. Yet, five brave students from the University’s Department of Anthropology signed up not only for the field experience but to provide a service for one of the Missoula community’s most beautiful gems. Our mission as we chose to accept it – a full architectural survey of the dilapidated “Main Cabin,” built sometime between 1890-1910, and an inventory of the many artifacts that are stored in there, almost as if the inhabitants went out to the field for the day and might home anytime. The “Main Cabin” at the Moon Randolph Homestead. Fast forward to now and we are just beginning our third of five weeks. During our first two weeks we accomplished a lot and what feels like never enough. We have endured drastic changes in temperature – our first day was windy and in the high 50s and today we were pushing into the high 90s with not even a light breeze. The wasps are getting tired of our intrusion and our bull snake friend (how big he really is ranges between 3-5 feet depending on the storyteller and the listener!) is not too thrilled with us poking around in his home either. The spiders – well, we won’t even go there. Our main tasks so far have been full photographic documentation of the cabin and landscape, a vegetation survey of the immediate cabin vicinity, and SO MANY measurements. We have measured every nook and cranny of the interior (including the “cold room” off the kitchen which has acquired the loving moniker of “the Snake Hole Lounge”) and every surface of the exterior. We are currently working on the drawings based on those measurements and will soon begin the artifact inventory. Caroline graciously offered to add a blog feature to the Moon Randolph website for us to share our experience with you all and is even going to let us stage a temporary takeover of the Instagram account! We already have a few blog posts ready to go about some interesting finds and observations that we have made thus far so check here often for new entries or the Instagram and Facebook page for more photos. We will be sure to keep you all informed, possibly entertained, and may even call on you, the Missoula community, to help us figure out what some of these artifacts are that have us scratching our heads! Thanks for reading and following our journey!